On Saturday, the sun finally shone all day long for the first time in about two weeks of otherwise cloudy winter weather. The skies were clear and blue and the sun sent lukewarm promises of future growing seasons. The native birds that call this farm home were flitting backwards and forwards enjoying the warm sunlight in the bare orchard, whilst on the ground the canine fluffy collective were enacting dark stratagems against their companions in the ongoing Bone Wars. All the while the winter sun benignly shone down on the farm and the off grid solar power system recorded its best ever output of 9.8kWh for a day this close to the winter solstice. The editor and I cheered at that result. 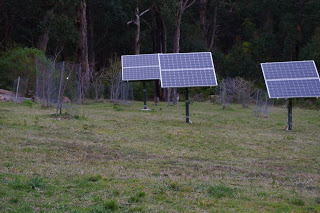 To put the result into some context, there are 30 solar panels connected up to the off grid solar power system which equates to about 5.7kW of potential output. Of course such an outcome does not happen without a huge amount of development, trial and error, and sheer hard work. And such was the case this week because we had added another four solar panels to the system. I purchased those four panels over the past few weeks, and I must add that I always enjoy visiting the shop where this solar stuff is sold. The folks in the shop look like the real deal to me as if they’d enjoyed a massive night, and now in the cold light of day, they were coming down like a dirty mongrel. Or perhaps instead I rather fancy that they’d only just left their remote forest blockade encampment where they’d been protesting against the logging of old growth rainforest. Whatever the case may be, and acknowledging that the truth is possibly far less exciting than my flights of imagination, I always feel in that shop as if I am partaking of some very cool, and very subversive act. Yes, Fight Club – the Solar Years! Anyway, purchasing solar panels is only a minor part of this upgrade story. A long time ago I used to have a mate who owned a Harley Davidson motorbike. My mate was forever sending his motorbike off to have some modification made to the standard components. Of course, my mate was constantly complaining that if he changed one aspect of the standard design, then other parts needed modifications. For example, he modified the motor so that the motorbike went faster, but of course, then the brakes and suspension had to be upgraded because there seemed little point going faster and not being able to stop in time, or go around corners at speed. Upgrading solar power systems is a lot like that, in that if you add more panels in the system, then something else has to give. And adding four extra panels was beyond the capabilities of the previous set of battery charge controllers (otherwise known as regulators). 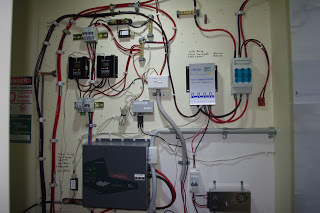 Regulators are important in an off grid solar power system in that they make the decision when and how much electrical energy to send to the batteries. They do this trick by monitoring the voltage and temperature of the batteries. They are in effect the brains of the off grid solar power system! As a comparison, in a solar power system that is connected to the mains electricity grid, regulators are not necessary, because the mains electricity grid is so huge and so wastefully inefficient that it can take any and all electricity generated by solar panels. 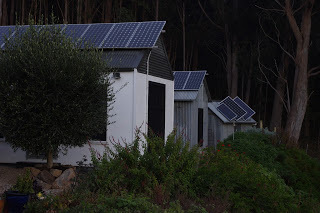 Off grid solar is very different because batteries are very particular about how much electricity they can take in and also just how fast they can store it. The regulators seamlessly manage this process. On a practical level this can mean that the solar panels may be generating electricity, but if the regulators decide that the batteries don’t need it, and you can’t use that electricity yourself, then it simply disappears. 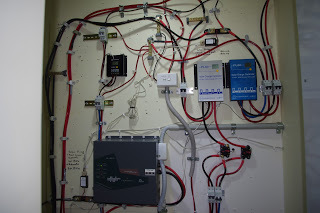 This week I had to upgrade one of the regulators so that the system could accommodate the four new solar panels. This is what the systems brains looked like before I replaced one of the existing regulators. Although the past two weeks have been uncomfortably cloudy, the solar panels have still produced some electricity from the weak and cloud obscured winter sun. This meant that I was unable to make any changes to the brains of the system during the day because any electricity generated by the solar panels had to be either stored in the batteries or used. So during the evenings this week I have been tooling around with the brains of the solar power system. Brain surgery! After a lot of hard work and late hours, the wiring job was eventually finished. The replacement regulator was installed, the wiring done, and then all I had to do was get the four new solar panels up on the roof. The rats nest of wires in the above photo may look like a total mess, but none of the wires are touching any other wire, everything is correctly fused in case there is a problem and I see a sort of beauty and simplicity to the entire brains of the system. Of course a person has to be careful with the brains of a solar power system as the solar panels can produce the sort of zap for hours on end that is only produced by high end commercial electric welding machines and even those can only supply an equivalent zap for a very short period of time. 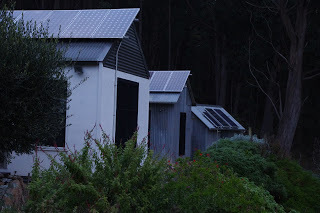 After another days work, the solar panels were physically installed onto the roof of the shed. 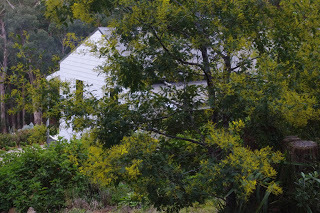 Towards the end of that day whilst I was perched high up on the steep roof of that shed, it rained. What else can a person expect over winter! The next morning after another couple of hours of work the four new solar panels were wired up. Observant readers will note that in the above photo there is space for one further solar panel on that racking on the roof. 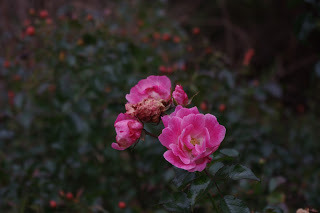 We noticed that space too, but the solar power system has consumed so much of my time, energy, resources and thoughts over the past few weeks that I cannot face any further unnecessary work on the solar power system this year. We really enjoy the challenge of living with solar power, and it really is an amazing technology. However, the ugly truth about solar power is that the sun only provides energy intermittently. If the weather conditions are cloudy, rainy, or snowing then solar power is not going to produce much electricity at all. And at night the solar panels produce nothing. 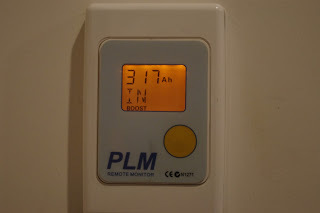 So despite having years of practical real world experience with this technology, I can only ever take guesses as to how much electricity will be available for our use for about a month either side of the winter solstice when the sun is very low in the sky. The only thing that I can deduce from that experience is that anybody attempting to sell the idea of an industrial civilisation powered using electricity sourced from solar panels – as the technology currently stands – either does not live with solar power as their only source of electricity, or they are taking the piss. You know when it is 1’C / 34’F outside that it is going to be a cold winters night! Clear blue winter skies are great for generating solar power, but by nighttime the air temperature on those days starts to get quite cold (well at least it is cold for this part of the world!) At least the insides of the house were toasty warm at 20’C / 68’F. Neither the editor or I enjoy sleeping in an overly warm house, so we usually fill the wood fire up before going to bed and then simply let it burn down without dampening the fire down (i.e. throttling the oxygen supply to the combustion chamber). The wood fire burns down quite quickly, and by the morning the temperature inside the house was 15’C / 59’F. 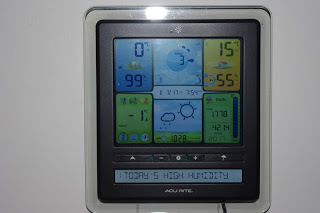 However, outside the air temperature was a very frosty -1’C / 30’F. That air temperature is about as cold as I have seen it here (whilst also acknowledging that things could always get worse!). The ground in the shady orchard has been frozen for about four days now (the fancy name that I just created is tempafrost)! 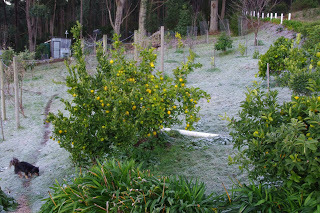 I have never seen a frost extend beyond two consecutive days before. 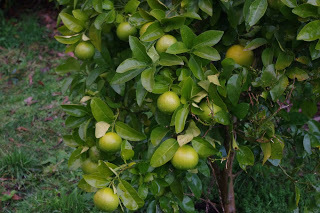 At least the sunny orchard which has been bathed in winter sunlight, has thawed by lunchtime. 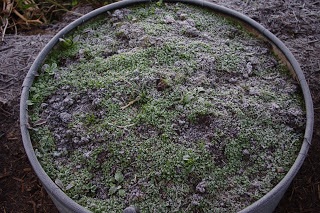 It will be interesting to observe what effects this extended frost has on the plant life here. On a brighter note, Poopy the Pomeranian (who all correct thinking folks know by now is actually a Swedish Lapphund) has been enjoying this cold weather as it must be recalling his cultural memories of romping around the snow in Northern Europe herding reindeer! Swap frost for snow and wallabies for reindeer and you too can vicariously enjoy Poopy’s Australian winter experience. Toothy is not so much of a fan of the frost. This can be explained by his short legs – he is a long haired Dachshund after all – which places his nether regions uncomfortably close to the frozen ground. The other day I was at the plant nursery purchasing a deep red flowering camellia for the editor, and I noticed that they were selling asparagus crowns. 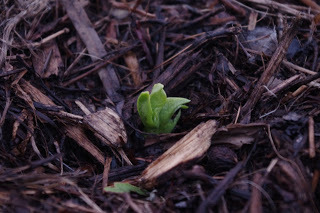 Back here at the farm I noticed that one of the asparagus plants had become somehow confused and was sending out new shoots. 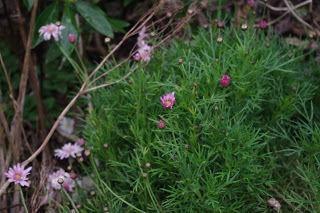 I have no idea whether these shoots will survive the continual frosts. Anyway, I must not complain, because for two glorious winter days this week, the sun shone brightly (albeit with little winter warmth) and it was a real pleasure to see that sun being converted into electricity by both the new and the old solar panels! 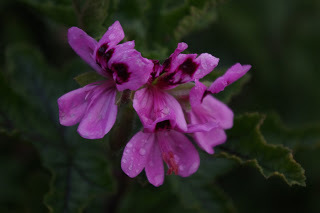 Just in case anyone was concerned that after two days of sunshine the winter here had become a little bit soft… today winter rushed back in with a vengeance and 14mm (a bit over half an inch) of rain fell (and the day is not yet done!) 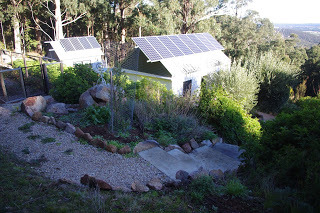 The winds howled and all those 5.7kW of solar panels produced only 1.5kWh for the entire day. 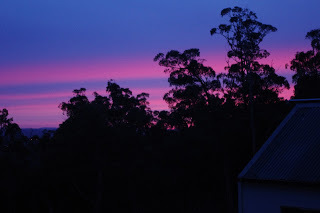 With absolute respect for the awesome band: The National; for their outstanding song: The System Only Dreams in Total Darkness which provided the lyrics for this weeks blog. I strongly urge you to check out their video clip. This week was a really tough call on what lyrics to use for the story line as whilst rewiring the battery room on the radio I also heard the song by: Eves The Behavior with her song: Electrical. It was a really tough choice to pick between these two most excellent songs. The temperature outside now at about 9.00pm is 6’C (43’F). So far this year there has been 401.6mm (15.8 inches) which is more than last week’s total of 400.2mm (15.8 inches). Black truffles are a mysterious black fungus which grow symbiotically with infected oak trees. 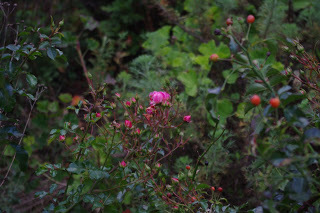 They’re a high end delicacy and growing them is a big, although secretive, business. About a decade ago the editor and I attended a truffle day held by a local agricultural society. The truffle day involved a talk about the complexities relating to growing black truffles in our area. After the talk, the group retired to a local pub for a lunch, which I feel is always a good addition to an agricultural day. The lunch itself contained black truffles in its many guises. I’m not convinced that I’m much of a fan of that mysterious black fungus, but tastes apparently vary. Anyway, the lunch was held in a local pub which was being restored. It is a beautiful old timber Victorian era pub which had unfortunately succumbed to a fire at some stage in its history and the building had long been derelict. The restoration works on the pub were nowhere near complete at that time, and so lunch was held in the old stables. The fungi infused food was prepared in a separate food van, whilst the insides of the stables were dark and quite cold. It was almost a medieval scene as the winter cold radiated from the floor and the lights along the walls sat in sconces. Long tables were lined in cloth and benches were provided to sit upon. The editor and I knew nobody at the truffle day, and so we chose an empty bench and table to sit at. The dining hall soon filled up with hungry people. Two gentleman eventually sat opposite the editor and I. Introductions were made and pleasantries were exchanged. And we have been good friends ever since. 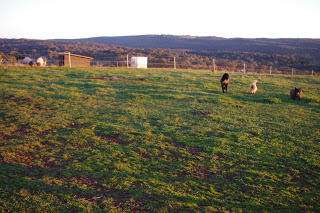 In a strange coincidence, our new friends were also beginning to set up a small holding not too far away from where we are. However, to this day I am in absolute awe of what they have achieved. Their vision is nothing short of epic. And their house is a truly original design. 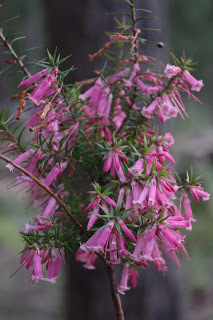 Last weekend the editor and I visited their farm and assisted with planting 150 (of 240) tree lucerne (Tagasaste) plants. Our friends intend to use the trees as cattle fodder in future years. 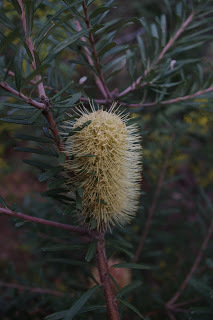 This is a good thing as that tree is one of the richest sources of protein in the plant world. 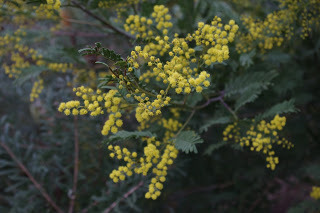 More importantly, that tree will provide green feed during a hot summer when the paddock forage is yellow and dry. I’d never planted more than 30 trees before on a single day before. It was an epic challenge. 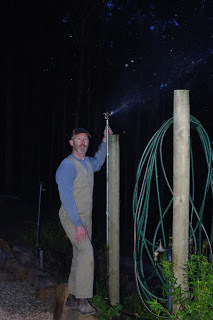 The editor and I are both used to a hard day of physical work, but after six hours of drilling planting holes and hammering in metal stakes (we call them star pickets) I was exhausted. I jokingly (maybe!) remarked to one of the gentleman that: “Mate. I don’t work this hard for myself!” Of course that is not entirely true as long term readers will be aware. 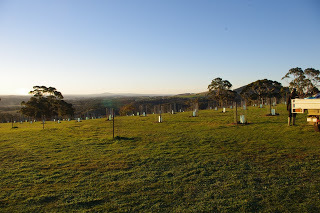 Eventually the 150 trees were planted and the sun had yet to set. 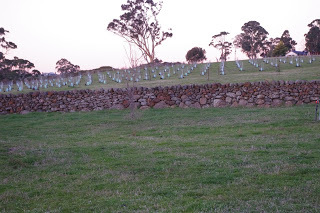 The neat rows of new trees looked fantastic in the setting sun. 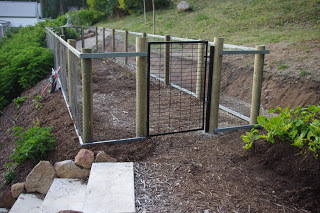 Of course, the job was made particularly difficult as the new seedlings had to be protected from the local population of rabbits and kangaroos, both of which require different types of tree protection. A closer photo shows the various tree guards placed around every single tree. I almost forgot to mention it, but our friends live in a shed. 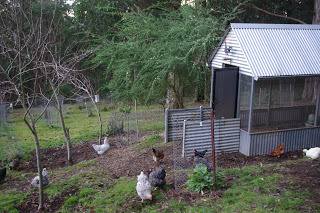 The word shed is perhaps a misnomer as the shed in question is not just any old shed. The shed is the size of an aircraft hangar, except maybe bigger. It really is an impressive shed and it has a footprint of about 1,000 square metres or 10,760 square feet. And they live in a beautiful home created at one end of that immense shed. 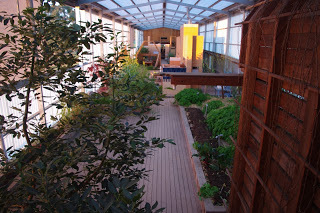 Inside the shed are all weather growing spaces that I can only dream about. 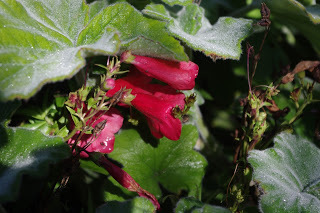 The rate of growth for the plants grown inside that shed is at least five times what I observe here. 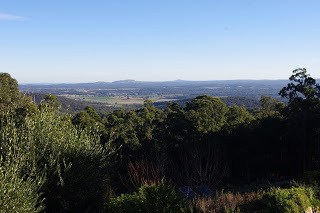 Observant readers will note in the photo above, that to the immediate left of the view, there is a rather large avocado tree which was planted at about the same time as the avocado tree here, but is about five times as large as the one here! 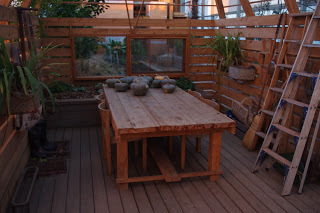 There are many beautiful and thoughtful places inside that shed too which makes a delightful place to while away a few hours drinking wine and talking rubbish with good friends. Some of those places are also used to store their produce. The location of that farm on top of an extinct volcano ensures that they receive more winter sunlight than the farm here. 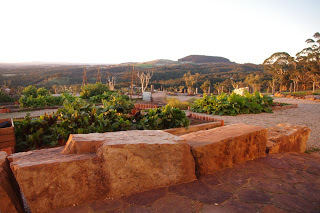 The extensive vegetable parterre soaks up that additional sunlight and I have to add that their vegetables – like here – also enjoy a spectacular view of the surrounding countryside. 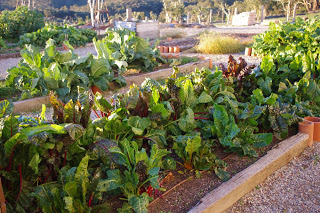 The farm has a diverse collection of farm animals and that means lots of animal manure and the vegetables in those garden beds reflect the good soil health. 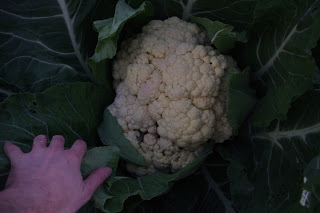 The cauliflowers in particular were huge and I witnessed the cows greedily munching away on a particularly choice bit of cauliflower. Surrounding that vegetable garden is a large number of mature olive trees that were rescued from an olive grove. I used the word rescued because the owner was intending to rip out all of the olive trees. I’m impressed at how many of those relocated olive trees actually survived the process. Of course, they have to grow a lot more vegetables than I am used to seeing because they raise and process a lot of their own meat. 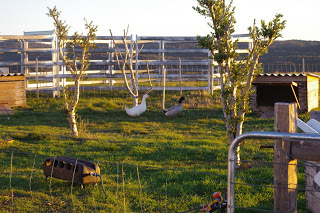 They recently added ducks to the menagerie. At the other end of the shed away from the house, live milking cows and chickens. 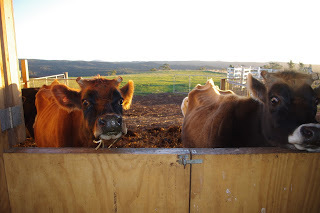 The cows are surprisingly inquisitive creatures and they are always checking out everything that goes on about the place. Both cows have bred calves. However, the award for the most inquisitive farm animal there has to go to the pigs. The two sows are huge and pigs have a sort of suction cup face which snuffles anything and everything. Nothing is left un-snuffled by those suction cup faces. 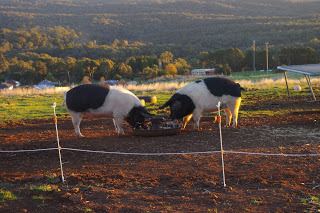 In the next photo you can see the two sows enjoying left over whey from the most recent round of cheese making. It is a relief to see that their canine collection is as motley a collection of canines as my lot here. Of course that description excludes the working maremma farm dog which earns its keep and avoids most of the sillier canine activities. I hope you all enjoyed the brief trip away from Fernglade Farm! 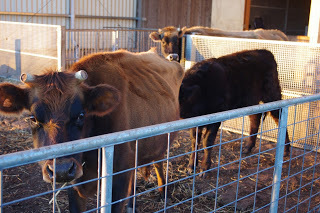 Also many thanks to our friends for allowing me to write about their lovely farm. 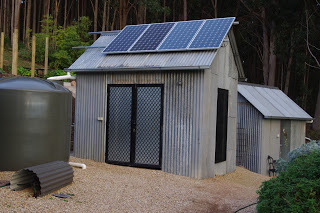 This week I began upgrading the small 12 Volt off grid solar power system (we’ll call it the 12V system from here on). 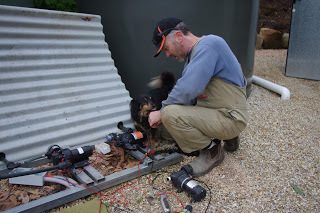 I originally set up that small 12V system so as to test the feasibility of solar power at this farm. 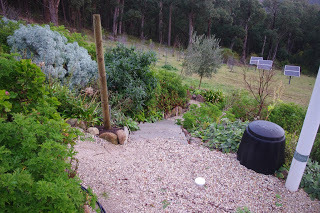 The system seemed to work, and nowadays that 12V system runs garden lights and water pumps for part of the garden. The upgrade came about because when I went to the solar stuff shop the other week, I noticed that they had a special clearance on 12V solar panels. 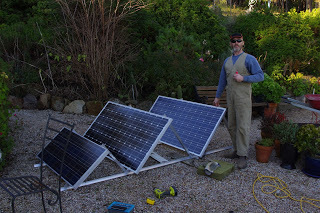 I thought that I would help myself to one of those ultra cheap 12V solar panels. Unfortunately, once you purchase a solar panel, you sort of have to then do something with it because solar panels are not small and I am not allowed to stockpile stuff. With that in mind, the editor and I constructed a custom made solar panel racking so as to hold three 12V solar panels on the wood shed roof. 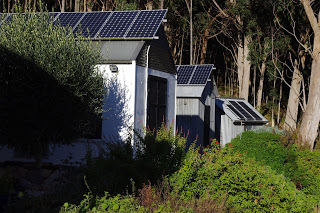 That wood shed roof faces west which is not optimal for solar in the southern hemisphere. Of course, a west facing roof is not a problem for us clever types who can construct their own customised racking for the three solar panels. A prototype of the racking was constructed. The custom rack was then mounted onto the roof of that west facing wood shed. The solar panels were lifted onto the racking and then bolted into place. Then we watched the sun move across the panels and discovered to our absolute horror, that each solar panel threw shade over the solar panel behind them. Any shading at all on a solar panel will stop the panel from producing useful electricity. So, as well as being not so clever as I thought – and you can ask the editor about this – I was apparently very grumpy to boot. The whole construction had to be pulled apart and the solar panels again lowered to the ground. After a huge amount of hours, the racking was then adapted so that the three 12V solar panels now faced west. This means that they will only charge with the afternoon sun. I don’t believe that this will be a problem for the 12V system which requires very little electricity to operate, but time may inform me otherwise. 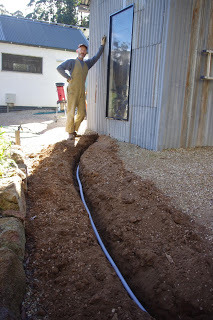 As usual, I then had to dig a trench in which to lay the cables connecting up the solar panels to the batteries. For some strange reason, I always seem to be digging somewhere about the farm. 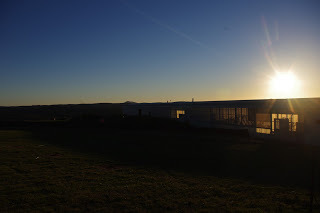 As you can see in the photo below, the sun was shining strongly that day and even though it is only less than three weeks past the winter solstice, those 12V solar panels were producing plenty of power! 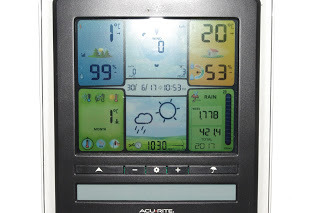 Best of all, the house solar panels that same day produced their best ever July winter output of 11.4kWh for that day. That result is the culmination of seven years of trial and error testing and a huge amount of work every single year. And you know what? Over winter there will be days that won’t achieve even 10% of that result. Solar power is a very sobering energy source. The temperature outside now at about 10.00pm is 7’C (45’F). So far this year there has been 432.0mm (17.0 inches) which is more than last week’s total of 401.6mm (15.8 inches). Long term readers will recall my sordid love affair with the coffee beverage. Well, sad times have hit Fernglade farm because today the espresso coffee machine died. This is a total latte disaster. Now in such situations some people may fall into a funk. I am not one of those people. Instead I say, let’s get funky! 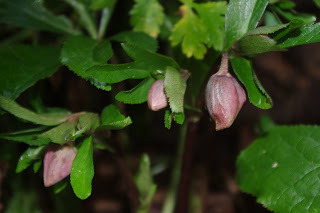 And so this week I’ve shamelessly borrowed lyrics from the most excellent English modern soul musical collective band: Jungle, with their song: Busy Earnin’. Without further ado, let’s get funky. The government run broadcaster in Australia recently aired a three part television series called: “The war on waste”. This particular three part series has been enormously influential and it has certainly captured the imagination of the public. I have been surprised at the sheer number and diversity of people who have discussed this program with me. Of course, I try not to produce any waste at all here as waste appears to me to be a form of wasted income. And who would seriously waste income? Anyway, the editor and I were at a friends house a few weeks ago and we were all discussing the war on waste series. As part of that discussion an amusing story about an almost electrocution incident involving a vacuum cleaner was told. The vacuum cleaner had apparently suddenly and rather catastrophically failed. Our friends mentioned that they were now using another machine. Apparently this other machine was no longer performing as well it used to. Now I know a thing or two about small appliance repairs. And for the record, I too have destroyed a decade old high quality vacuum cleaner. I call the lessons learned from my particular vacuum cleaner incident: The third filter theory. The third filter theory states that: “for any machine that moves air or fluids, there are always more filters than a reasonable person would expect”. As an interesting side note, I believe that part of the greater waste problem (which we are now at war with) arises because as a society we fail to maintain the stuff that we actually do have. I am very diligent about maintaining the stuff here because to me waste is wasted income. As a caveat though, I have to be aware that things actually need to be maintained. And sometimes I am blissfully unaware that maintenance is required on an item of stuff here at the farm. My first brush with the third filter theory was that years ago I had a very high end vacuum cleaner (which I alluded too earlier). I diligently maintained two filters on that machine. I was not aware of the third filter, and after a decade of use of that machine, that third mystery filter was completely blocked. Eventually the motor in the machine overheated due to the blocked filter which caused black smoke and a rather unusual acrid smell to arise from the now very deceased vacuum cleaner. And I had created expensive waste. So, when my friends told me about problems with their vacuum cleaner, I suavely mentioned my third filter theory and said that I’d be happy to have a look at their machine. Sure enough after a brief inspection of the machine, I discovered a filter which was almost completely blocked. A quick clean of the filter and the machine was working as good as new. That created no waste, except for the rather intriguing gunk in the blocked filter which for health and safety reasons, I didn’t examine too closely! That was my good deed for the week and I rather felt that the Universe now owed me some bonus points as a result. Apparently not so! A few days ago, I noticed that the espresso coffee machine sounded differently than what I was used to hearing. 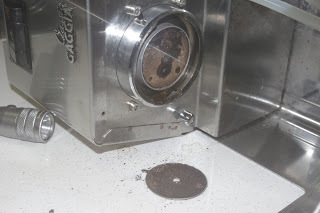 Then I noticed that the extraction process (that is a fancy term for pushing pressurised water through compressed coffee grounds) was much slower than it had been in the past. I thought to myself, I can do small appliance repairs, and so I took a look at the parts and components diagram supplied with the coffee machine (note that these diagrams are a rare item these days). I noticed that after the water pump there was a part labelled as a “shower head”. Well less abstruse language would possibly describe a shower head by another less technical name which is a: “filter”. Filters of course need to be cleaned from time to time and this machine has been in constant operation for at least a decade without cleaning that filter / shower head. I should note that the instructions supplied with the machine implicitly stated that the shower head was to be regularly cleaned. Alas for my poor reading comprehension, because the blockage in the shower head caused the water pump inside the coffee machine to fail. The third filter theory strikes yet again! Fortunately I have averted creating too much waste because I was able to track down a new water pump today and hopefully I should be able to install the pump within the week. On a less positive note, the editor and I are left bereft without morning coffee for one whole week (and can’t get enough coffee!) – and I for one am most certainly not a morning person! There must be something in the water (algae? 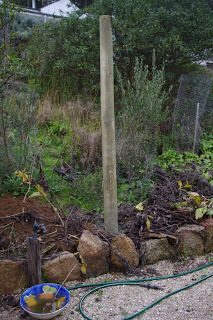 ), because this past week I replaced another faulty water pump which was used for garden taps and a bushfire sprinkler. Over the past few years we have been experimenting with water pumps and whilst the third filter theory always applies, my other general observation with water pumps is that you get what you pay for. Cheap water pumps appear to not work for very long without failing without warning, even those that have regularly cleaned filters. Whilst I was replacing the faulty water pump, I also decided to replace the ¾ inch water pipes leading away from that water pump. The reason for replacing that water pipe is that in recent years I have been ensuring that the infrastructure here is easily inspected, maintained and repaired. 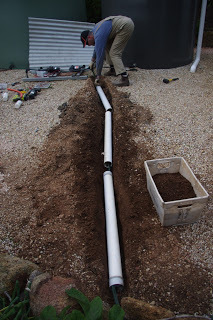 The original water pipe was buried so deeply that if it had leaked anywhere or any join had failed, then I would not be able to easily identify the cause of the failure – and that situation makes things much harder to repair and possibly also creates a lot of waste in the process. Part of that simplification process also involves moving garden taps and sprinklers away from walking paths where they can by accidentally knocked into. 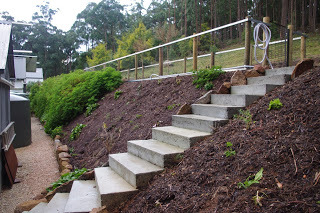 In addition to that, I have been mounting garden taps and bushfire sprinklers on very sturdy treated pine posts which are cemented into the garden beds. The posts are expected to have a very long lifespan in those conditions. I finished the job as the sun set this evening. 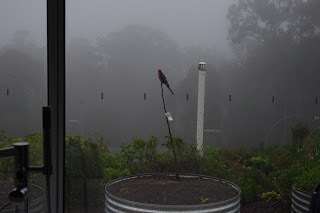 Observant readers will note that in the above photo the 30m / 100ft garden hose is now hanging from a sturdy steel hanger off the treated pine post instead of laying around on the ground. 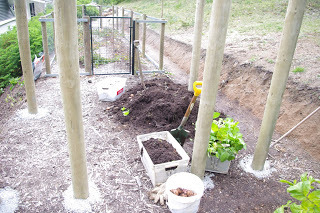 Speaking of treated pine posts, this week we cemented into the ground, the many treated pine posts which will be used to hold fencing so that we can increase the size of the tomato enclosure. We plan to use the additional growing space in that tomato enclosure to grow capsicums (peppers), eggplants, and various berries. 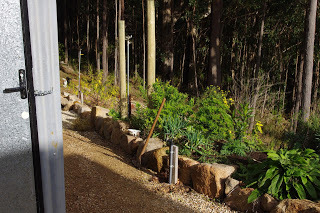 Other garden taps which currently sit in the paths will be moved over the next few months (or when the pipes fail). 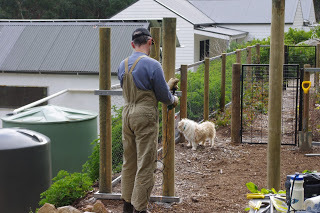 Firstly we have to install the treated pine posts which the garden tap and hose hangar will eventually be anchored to. A mum and bubs pair of kangaroos have more or less adopted us and the farm. 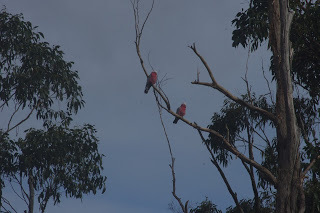 The pair have been regular visitors ever since the joey (a fancy name for a baby kangaroo) was in the mums pouch. Kangaroos normally live in mobs (a fancy name for a large-ish number of kangaroos) so there must be a story behind why these two don’t. In the meantime the kangaroos are enjoying the facilities. We are currently enjoying lots of fresh Cape Gooseberries as well as the usual citrus and winter vegetables. 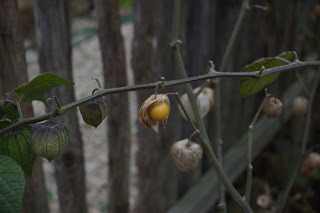 Cape Gooseberries are an interesting plant as the fruit grows in little paper lanterns. 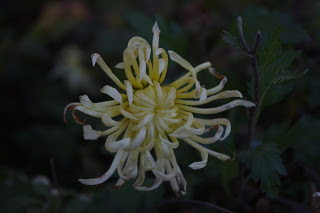 This plant is several years old now and very productive. I reckon we need to get funky one more time, so thanks and respects to the band Jungle and their funky song Busy earnin’ who provided the lyrics used in this weeks blog. The temperature outside now at about 9.00pm is 5’C (41’F). So far this year there has been 441.2mm (17.4 inches) which is more than last week’s total of 432.0mm (17.0 inches). The statistic in the article was that (and you can confirm this by reading the above article) Melbourne’s dams are currently 62% full after an apparently dry June. 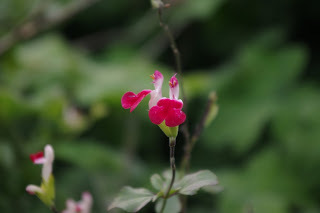 I agree with the authors that June was dry, but I was particularly curious because April’s rainfall was at least three times higher than the long term average and the remainder of the year was more or less about what you would reasonably expect here. Upon being alarmed by that article I had to make sure of my own water storage reserves.Therefore, I undertook a scientific analysis of the water storage here. 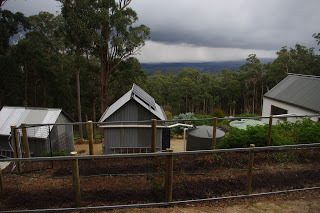 That analysis involved me walking around the farm and checking the level of water held in the various water tanks. I discovered that the water tanks were about 99% full (if not completely full). Why then are Melbourne’s dams currently at 62% full? It made no sense at all to me, and the article made it clear that the average litres of water used per person per day had declined recently to about 162 Litres (42.6 gallons) per person per day. I‘m not the sharpest tool in the tool box and mathematics is certainly not my forte, so it took me a while to recall that the city of Melbourne is apparently adding an additional 100,000 people to the population every single year. The increased water demands makes sense from that perspective, because even though the average water demands of individuals are declining, if the population itself increases in size then overall demand for water increases in line with that population growth – every single year. As an interesting side story, I used to work for the big water supply authority as a wee young lad before being made redundant during the recession in the early 1990’s. Way back in those days I recall working with a team of engineers who were doing some sort of work on the Thomson Dam. That dam is huge and quite impressive to see, and it holds a volume of water that is beyond my understanding. This of course may be possibly due to my limited mathematical skills! I mean who even understands what: 14,170 × 103 m3 (500 × 106 cu ft) of water means? I guess it is a lot of water, that’s for sure. Back in those days I heard the claim made that the Thomson dam would drought proof Melbourne. Nowadays however, in these more enlightened and higher populated times, we now have a desalination plant (that is the fancy name for a big machine which converts sea water into fresh drinking water) to supplement the drinking water requirements of Melburnians. And with the dams down to the low 60% full range, that desalination plant looks about set to be switched on. Houses are not immune to the laws of supply and demand. By now, most people down here realise that an increase in the population leads to an increase in the demand for housing. Increased demand for housing in turn leads to an increase in the market value (the less fancy name for this is: prices, and the more fancy name is: economic scarcity) of the existing stock of housing. And of course, increased demand for housing means that there are jobs for people who are involved with constructing new houses. The downsides to this arrangement is that whilst the ever increasing population leads to increased house prices, some of that increased population can no longer afford to purchase a home. Those particular people have the options of either renting a home or being homeless. Someone mentioned to me recently that in Australia, couch surfing is covered under the definition of homeless. As another interesting side story, I have noticed that the same newspapers seem to be running semi-regular articles involving very appealing looking young ladies and their even more delightful canine companions living in tiny houses and/or vans on other peoples properties. The funny thing is that those same newspapers also decry homeless people living in vehicles in public places. When I was a child, which was way back in the 1970’s, my mother, who was a single mother with three children, was able to purchase a family home on a single full time income. She was also able to attend University part time free of charge and put all three of us kids through private secondary school. During the mid 1990’s the editor and I jointly purchased a small inner city workers cottage of modest size in poor condition which needed repairs for about three times our joint full time incomes. Both the editor and I also enjoyed the privilege of studying at University but had to pay off some student debt. Nowadays in these more enlightened times, you would be hard pressed to purchase the same three bedroom inner city workers cottage for less than about $1.3m, which is no longer anywhere near three times our joint full time incomes. And University fees have climbed considerably since the days that I had my nose buried deeply into serious and learned text books. What happened was that population pressures influenced house prices. However, you can also see in the apparent increasing population that demand for drinking water which is a finite resource is also under pressure. Who knows where we will be in another ten years with yet another million people in the city. And I wonder what will become of those people who are excluded from being able to purchase a house? How do I work this is another fascinating question. The funny thing about houses and property is that people inevitably ask me for my opinion as to their options. Usually the people are considering replicating some aspect of the farm here. And the advice I provide is to purchase a property that few other people are competing for. Low demand I’ve often noticed, equates to lower prices. The problem with low demand is that often it looks like the biggest dump in an otherwise nice area, and generally involves a lot of hard work. To sum the situation up, that option generally looks unappealing. The only other option that I am aware of is: wait and see. The thing is, a persons life also only covers a finite span of time. And nobody knows how long the current state of affairs will continue. The editor and I have only ever pursued the dump option where we have been able to undertake the repairs ourselves. And all of the houses that we have ever purchased have needed (usually major) repairs. For example, we lived in a 1890’s workers cottage that initially had only a single power point, a repaired floor in a single room, and unidentified chunks used to flow out of the cold water tap. And throughout that time we worked full time and occasionally studied part time. I just don’t know any other property story as they all look like speculation or wasted time to me. I went to bed last night feeling fine after having written the above. 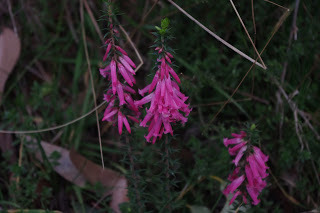 This morning I woke feeling sick as I had come down like a dirty mongrel with a head cold. These things happen. Earlier in the week when I was feeling much healthier, I repaired the coffee machine. The repairs involved replacing the water pump, which from hindsight we believe may or may not have failed. Whatever may be the case, we were struck down hard by the “third filter theory” as we discovered yet another blocked filter on that coffee machine. The blocked filter was cleared and cleaning fluids were left inside the workings of the coffee machine overnight. I can quite proudly state that the coffee machine is now working well and despite my cold we are in latte heaven again! We have been busy cementing two more treated pine posts into the ground this week. Both posts will be used to mount a garden water tap and hang a hose from. 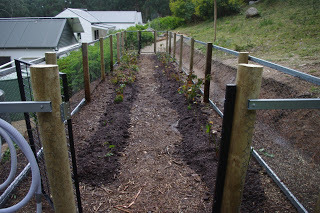 The berry enclosure has also now been extended and planted out! Earlier this week a garden bed full of tasty potatoes had to be removed from that berry enclosure to make way for berries. 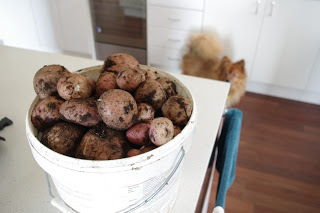 That raised potato garden bed produced a huge amount of fresh home grown potatoes. 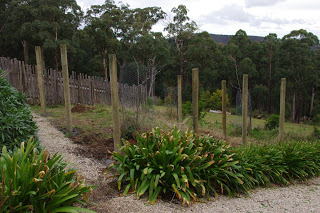 The fencing for the berry enclosure was then extended. The fencing was soon completed. The gate was relocated to the new extended front of the berry enclosure and the now superfluous two original gate posts were recovered. The berry extension – Done! Of course we then had to plant out the berry enclosure. 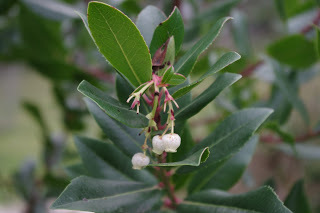 We discovered about thirty thornless blackberrry plants dotted about the farm. All of those were relocated into the new section of the berry enclosure. From the terrace down below the new berry enclosure looks great! And just as the editor and I had completed watering the berries, a huge storm rolled up the valley. 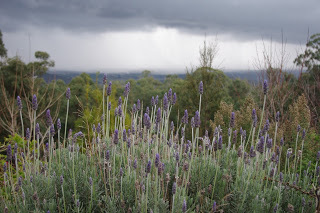 I managed to take a photo of the lavender flowers with the ominous storm in the background. 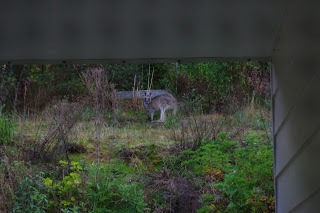 At this time of year the wildlife always moves in closer to the house. 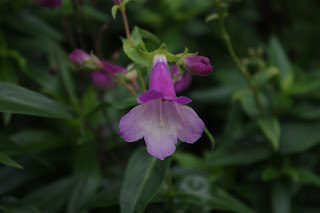 The reason for that is because the plants surrounding the house have more nutritional content than in the surrounding forest. This is a seasonal occurrence and every year I’m scaring some animal away from the garden. A kangaroo just outside the house asks the hard questions: What me worry? As the weather warms up, a lot of new birds are passing through the farm. As long as bones are not involved the fluffy collective prefer being inside the house in cold winter weather. 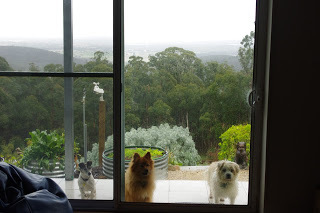 Let us in – NOW! 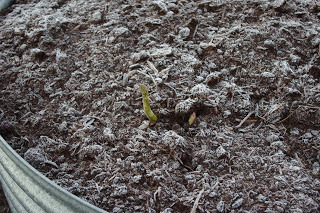 The asparagus spears are just starting to appear from the soil. 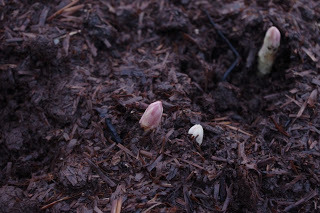 Asparagus spears are just starting to appear from the soil. 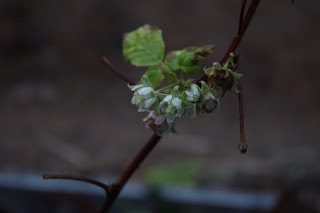 In the berry enclosure I discovered this very confused raspberry plant which appears to be producing flowers in late winter. The temperature outside now at about 7.00pm is 7’C (45’F). So far this year there has been 462.4mm (18.2 inches) which is more than last week’s total of 441.2mm (17.4 inches). 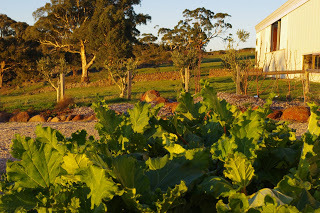 About sixteen years ago, when Fernglade farm wasn’t even the merest twinkle of an idea, the editor and I were driving through a country town on our way back to Melbourne where we then lived. By a strange coincidence that country town is one of the small country towns dotted around the mountain range here. The main road of that country town had a pointer board, pointing to a local art show. The editor and I loved local art shows and we had filled our home with all manner of excellent, interesting, and quirky original works of art. Wall space, we believe, is there to be filled with pleasing works of art. And what better way to support local country town community groups and nearby artists, than to attend the local art shows and maybe purchase a painting. After we paid the entry fee, the editor and I descended into that small country town art show and we just wandered around and enjoyed the paintings. As a bit of a background primer to country art shows, there are a few things to consider. Not all paintings are for sale, and if you arrive late, you may find that a lot of the art works will already be sold. There is actually a numbering system attached to each painting so so that visitors can obtain some basic information about individual paintings such as: Artist; Subject Title; and Price (or Not For Sale). That number can be cross referenced to look up those details in a small book that is usually free, but sometimes has to be paid for. If the painting’s number has a red round sticker then that usually indicates that the painting has already been sold. Any paintings that are purchased during the show can usually be picked up on the final day of the art show, once the show has closed to the public. You now have enough basic information to navigate a small country art show and look like you mean business! So the editor and I were walking around the art show and admiring the paintings, and one very cheeky and cheerful painting caught both of our attentions and imaginations. 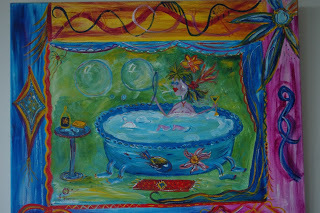 The painting is titled “Having a ball!”, and it depicts a delightful lady having a bath, whilst blowing bubbles and consuming what I’ve always assumed is a tasty alcoholic drink with a block of chocolate on a side table. Clearly, I thought to myself: here is a lady who knows how to enjoy herself! The editor was thinking similar thoughts, however I rather suppose that she had inserted herself into that image as she had a far away and very thoughtful look in her eyes. We decided to purchase the painting. Now some people quite rightly may say that this painting is not high art and they may well be correct in that assertion, and I for one am not qualified to make an opinion on that subject. On the other hand I read a theory that the Mona Lisa’s unusual smile was possibly due to the unfortunate condition of tooth grinding. As to whether that possibility is correct or not, I cannot say, however, what I can say is that if I had to choose between two people to take on the job of the local brew-master: one of whom was an apparently anxiety riddled tooth grinder; whilst the other lady, is to be occasionally found enjoying a quality stout (or fortified wine), whilst blowing bubbles in the bathtub. Let’s put it this way, the anxiety filled tooth grinder would be shown the door rather quickly. The unfortunate thing was that the art show still had a few hours left before closing for the weekend. And from the above discussion you may recall that paintings cannot be collected until after the art show is closed. The editor and I on the other hand wanted to pay for the painting and then take it and go, and not hang around for hours and hours, waiting for the art show to close. The editor suggested to go with purchasing Gambit A: Feign disinterest and apathy. We found one of the people taking the funds for the art show and said that we were interested in purchasing the painting, but wanted to take the painting away now. Of course it was explained to us that we had to wait until the art show was closed to take away the painting. Gambit A then suggests the correct response to be: Oh, don’t worry about it then. Thanks. And then prepare to walk away or look as if you are about to do so. Hopefully, at that point someone says: Hang on, I‘ll just check for you. If all is going well with Gambit A, you will shortly be introduced to the higher powers in the art show. In this case, the guy that was the higher power in the art show took one look at the painting and immediately agreed to let us take the painting early, as long as we were OK being shuffled out the side door of the art show. The transaction was soon completed and as we were unceremoniously shuffled out the side door of the art show, the higher power guy made a possibly disparaging suggestion along the lines of: “You could always hang it in your bathroom, I guess”. What an excellent suggestion! 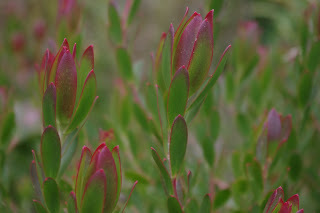 Long term readers will probably now be wondering the important question: “What the heck has this painting got to do with the Fernglade Farm blog, which is ostensibly a blog about living on a small holding in a remote corner of Australia?” It is a fair question too. The thing is, this week I have been rather ill with the flu – not just a regular Man Flu – but a proper full blown and filthy coming down like a dirty mongrel sort of flu. On Tuesday morning I sat in the hot bath feeling like a zombie in my hour of illness. 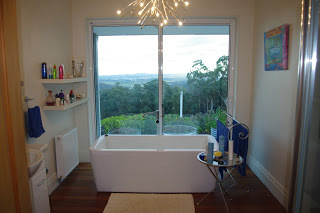 I was looking out the window into the forest when the editor cheerfully pointed out that the aforementioned painting looked an awful lot like the actual bathroom at Fernglade Farm, minus the bubbles, chocolate and stout of course. There is even a spider in the corner of the ceiling (not photographed for aesthetic reasons). The lesson to be learned here is that: What you contemplate, you imitate! And anyone who feels that marketing is not a powerful force on their subconscious are truly kidding themselves. Just before New Years Eve, a summer storm brought very heavy rainfall. 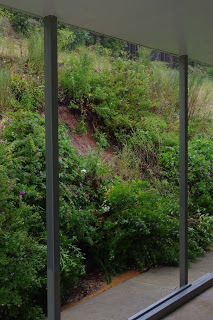 The result of that heavy rainfall was that a steep garden bed behind the house collapsed. Before this time we were blissfully unaware that landslides were even a remote possibility in this mountain range. This week we began establishing a garden bed high above that land slip area. 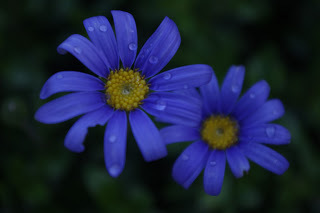 The garden bed is being planted out with very dense and hardy plants (agapanthus). 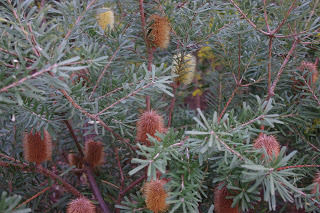 Those plants have very thick root systems which are being grown so as to break up the flow of any storm water collecting at that point. All those agapanthus plants are planted in a line so as to break up the concentration of water and then slow its movement across the land. 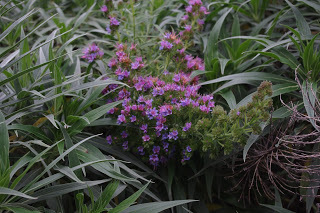 We use these plants in other parts of the property for a similar purpose and they have performed remarkably well under all sorts of adverse storm conditions. 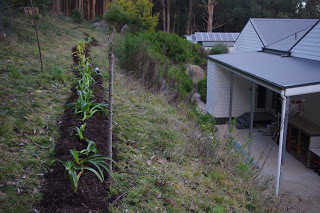 Over the next few weeks we will place a thick layer of composted woody mulch between the agapanthus plants and the edge. 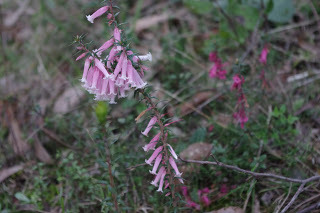 And into that composted woody mulch we will plant a diverse range of flowering plants that will also work to hold the soil together and slow the flow of water across the landscape. Hopefully all being well, there are no further landslips on the farm. The seedling potatoes which were purchased months ago were planted out today in the two remaining empty raised potato beds. 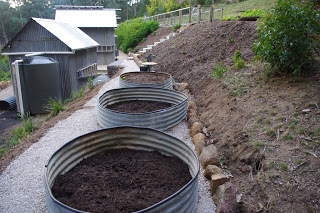 As the potato leaves grow, we add more compost into those raised garden beds. The editor surprised a small herd of deer the other day. With the assistance of Mr Poopy the Pomeranian (who every right thinking person knows is actually a Swedish Lapphund), chased the deer off into the surrounding forest. I’d have to suggest that the deer numbers are down as there were only four does and there was no sign of a stag in that herd. We believe that one of the neighbouring farms has been undertaking a shooting program for the deer. Just a quick joke before we finish the week’s blog: What has hips, but no legs? The temperature outside now at about 7.00pm is 6’C (43’F). So far this year there has been 471.2mm (18.6 inches) which is more than last week’s total of 462.4mm (18.2 inches).